This historical home in Fourth Ward opened up it's doors during off hours to some of us food bloggers to offer a preview of a few new menu creations you'll find on their Fall Menu. A highly sought after dining destination for over 20 years, there is much more than a kitchen and dining room living in this home-turned-restaurant. This home was built in 1891 and stands on the National Historical Record in what is seen as one of the most accurate representations of the Queen Anne/Shingle style homes in North Carolina. Rich in architectural history, the residents who preserved this gorgeous home over the years have an interesting history as well, you can read more about them here. Feeling like it was my lucky day when I received an invite to attend a Fall Menu Preview through my Charlotte Food Bloggers group. I have always wanted to dine here and it was finally my chance. Walking down the city street to the restaurant with leaves falling from trees around me onto the sidewalk, I felt this was a perfect start to a great Fall evening. The stairs to the front door creaked as I expected them to, welcome mat, hanging flowers and heavy, dark front door were all signs of a warm and welcoming home. I couldn't wait to see inside. I was greeted by familiar faces and a glass of wine within just a few minutes of walking past the stairs to the second floor into the foyer. Presented with little plates of their otherwise larger dinner portions, I was excited to taste everything very slowly to savor each small bite. Brussel Sprouts rarely find their way onto my regular salad rotation, I think that might change now. I am a big fan of just about any type of vinaigrette and to have poppyseeds also in there just made my taste buds do a little hop. In addition to vinaigrettes going well with just about anything, there are so many ways to enjoy a Balsamic Glaze too, especially on grilled salmon. 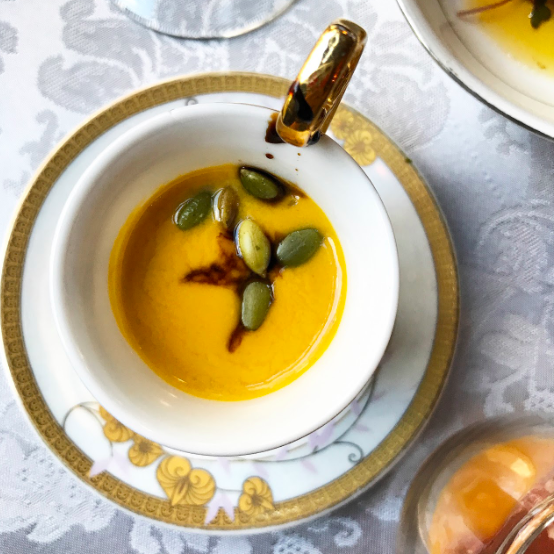 This pumpkin soup was no exception, and with the toasted pumpkin seeds, it was a great follow up to the vibrant salad. Hands down my favorite of the evening was the Pork Belly, braised for over 24 hours in apple cider. The least fatty and tender piece of pork belly I have ever eaten. Simply put, I wanted to drink the leftover juices in that little saucer! As for the other meat in this meal, the Lamb Chop, it was a bit rare for my taste. It had flaky and tasteful crumbs around the outside that gave it a nice crunch when dipped in the puree. The last menu item, the Pork Loin, did not stand a chance to be photographed. I was extremely hungry, the crispy kale chip and pumpkin puree underneath took me by surprise and I ate it out of turn, before the salad. I can assure you it was delicious and as tender as any pork loin should be, perfectly prepared. During the menu tasting we were given a sample of the wines likely to be paired with that dish at an evening dinner. The in-house sommelier is outstanding and opened my ideas about wine a little wider than they had been before I walked in. Each wine was well paired with each small plate. What I remember most was the go-to favorite of the restaurant for less frequent wine drinkers like myself, the Conundrum California Red Wine. Closing out the evening with a tour of the dining rooms, kitchen and Chef's Table and then two amazing desserts by chef Matthew Shepard, who was really eager for us to taste his Homemade Smoked Vanilla Ice-cream. Equally as enthusiast about the Flourless Chocolate topped with Chocolate Pot de Creme and Frangelico Mousse. I was equally as pumped to eat them as he was to explain the desserts to me. Superb finish. A very big thank you to Asterisk Creative, Chef Shepard, the kitchen staff, and Anthony the "wine guy" for a fabulous evening at your fine establishment. It was a memorable evening.